You'll love beginning and ending each day in this beautifully upholstered queen bed. The bed is draped in a beige fabric that features diamond button tufting and individual nailhead trim, giving the piece some style and personality. Furthermore, details like the rolled headboard design and cappuccino finished turned legs provide elegant details that bring this bed above and beyond the competition. 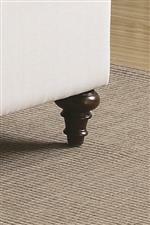 The Devon Queen Upholstered Bed in Beige Fabric by Coaster at Value City Furniture in the New Jersey, NJ, Staten Island, Hoboken area. Product availability may vary. Contact us for the most current availability on this product. 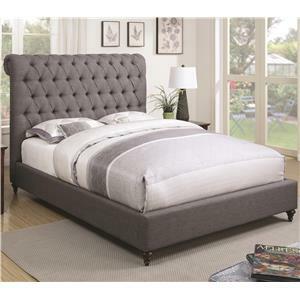 300525QB1 Queen Headboard 1 66" 56"
300525QB2 Queen Upholstered Bed Box 2 1 0" 0" 0"
The Devon collection is a great option if you are looking for Contemporary furniture in the New Jersey, NJ, Staten Island, Hoboken area. Browse other items in the Devon collection from Value City Furniture in the New Jersey, NJ, Staten Island, Hoboken area.